1) The Shark Rotator NV752 TruePet. This vacuum is, without a doubt, the best-selling vacuum we have had (and continue to have) on our website. It has many, many reviews on sites like Amazon, JCPenney, Kohl's, etc. and the majority of owners praise the unit. We also own the vacuum and have run it through many tests (including pet hair pickup tests) and have used it for cleaning around the home for over a year. It is one of our favorite vacuum cleaners and one of our “go to” machines when we do a thorough house cleaning. 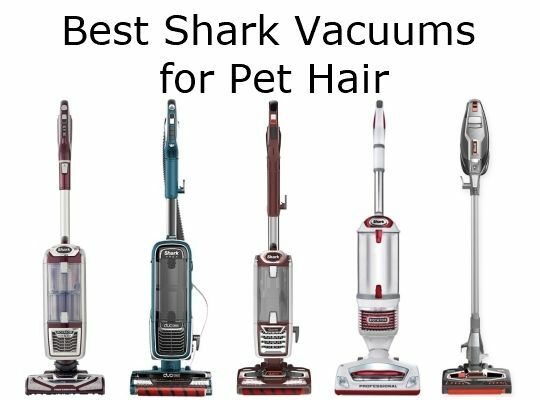 It is definitely one of the best shark pet vacuums. What features make the NV752 particularly good at managing pet hair? - It has a motorized brushroll. This ensures sufficient power to continually turn the brushroll at speed and deep clean into carpets, digging out all manner of dust, debris, and yes, pet hair. Some less expensive vacuums, especially canister vacuums, may have a brushroll driven by suction. Some of these bog down easily and do not deep clean well. - It has powerful suction. We measured it at 24 kPA (see video below) which is fairly close to many of the Dyson uprights. Powerful suction is critical to pulling up pet hair from both carpet and bare surfaces. When using the vacuum on bare surfaces you will also likely have the brushroll OFF so having exceptional suction here is very important. The NV752 delivers. - It comes with a host of tools, one of which is the TruePet Motorized Brush (a hand pet hair tool). This tool has a motorized brushroll as well. Many of these kinds of tools use a suction driven brushroll (you will often see these referred to as “turbo” tools or something similar). These tools can work ok but they will not have the power of a motorized tool. - It has a HEPA filter. Why is this important? A HEPA filter will remove the likes of tobacco smoke, dust mites, pet dander, pollen, mold spores, etc from the air. If you have a pet or pets in the house and you or a family member suffer from allergies or asthma, the HEPA filter will help you breathe easier. - It has an “Anti-Allergen Complete Seal” (Shark terminology). This means the vacuum is designed such that unfiltered air cannot bypass the HEPA filter or leak out through cracks or poor seals in the vacuum body. The result is that you always get properly filtered air leaving the vacuum cleaner. Shark APEX pet hair pickup is every bit as good as that of the NV752 above. However we have dropped the APEX to #2 due to the fact that there is more tangling of pet hair in the brushroll. The APEX has 4 rows of bristles on the brushroll (vs 2 on the NV752) and this arrangement, while great at digging up embedded dirt from carpet, has a tendency to really tangle longer pet hair. The brushroll on the APEX is easier to access and clean than that of the NV752 but it requires more frequent cleaning if you have lots of pet hair in your home. The APEX has DuoClean Technology (one soft brushroll in front with the typical bristled brushroll behind it). This approach allows the vacuum to do a very good job on smooth flooring and, surprisingly, it does not affect performance on carpet at all. In our tests the APEX did a great job on both bare floors and carpet. The soft brushroll on the front can sometimes also get a little tangled with long hair but it is generally easy to remove. The soft brushroll also helps the vacuum pull in larger debris and it pulls up stuck-on dust from bare floors. The APEX is one of Shark’s premier machines and the vacuum has a lot of great features. The swivel steering allows the cleaner head to move and maneuver very easily. The head turns with the twist of a wrist so it is easy to steer around furniture and to turn corners. The vacuum also generates very strong suction – something highlighted by many owners. The noise level generated by the APEX is also surprisingly low. It is actually one of the quietest uprights we have tested and the noise is also not too high a frequency – so it is not annoying. It comes with a HEPA filter and a sealed system. These features are important if you have a household with pets (and if you have asthma or allergies). The HEPA filters will ensure the elimination of things like pet dander, dust mites, tobacco smoke, etc. from the air. The sealed system will ensure that the air entering the vacuum does not leak out from cracks or poor seals in the vacuum body. The air is forced through all the vacuum filters (including the HEPA filter) before being exhausted from the machine. You also get the popular “Lift-Away” feature whereby you can carry the dust-canister/motor assembly in one hand while using the hose/wand/tools in the other. In addition, there are LED headlights on the cleaner head (great for vacuuming in dimly lit areas), and the vacuum comes with 4 tools including a motorized pet hair tool. The pet hair tool gets into tight areas the main cleaner head will not fit, and is also great for doing stairs and upholstery. The APEX carries a 7-year warranty. You can read our detailed review of the Shark APEX AX952. When we first got this vacuum we were a little surprised by the idea of a vacuum having 2 brushrolls, and frankly we were a little dubious. However, after running the vacuum through its paces and testing its performance on carpet, tile flooring, and on pet hair, we were sold. Far from being a gimmick, the dual brushrolls (what Shark refers to as DuoClean Technology) really do help the vacuum pick up more dust and debris – especially on bare floors. The front brushroll is soft and it grabs debris both large and small feeding it to the main brushroll in the center of the nozzle. We found that this approach really helps when dealing with large debris that may get pushed around by another vacuum. Also, on bare floors the soft brushroll kind of “polishes” away dust on the flooring and extends cleaning to the very tip of the nozzle head. Note: This vacuum is slightly smaller than the Shark NV752. As a result it is also lighter. The NV801 includes several tools one of which is a pet multi-tool. This is essentially a pet hand tool with a suction driven brushroll. It’s handy for removing pet hair from upholstery and stairs. It does the job but not as good as the motorized tool that comes with the NV752. The NV801 also comes with many other great features such as HEPA filtration, Anti-Allergen Complete Seal technology, 4 tools, lifetime LED headlights, easy-to-remove brushrolls (great for maintenance), the popular lift away feature, and washable filters. The NV801 carries a lengthy 7-year warranty. Onwer ratings for this vacuum are very good and we have scored the machine a very healthy 94/100, which translates to 4.7 stars out of 5. Tip: The NV801 is a similar machine to the Shark NV682 (another good Shark pet vacuum)– however the NV682 does not have DuoClean technology. So if you have mostly carpet you may want to consider the NV682 as its pet hair cleaning prowess on low to medium pile carpet is similar to the NV801 (we’ve tested these both side by side). Also, you should be able to find the NV682 for about $50 less than the NV801. You can see some comparisons between these two vacuums in our Shark NV801 review. This vacuum has been around for a while and we first reviewed it back in December of 2012. Its longevity on the market is testament to its popularity. On Amazon you can see that the vacuum has over 3000 customer reviews and it retains an average star rating of 4.6 out of 5 – which is excellent. This vacuum is also more reasonably priced that the NV801 or the NV752 and can often be found for around $200 and sometimes less. Pet hair cleaning performance on both carpet and bare floors is very good and owners sing its praises when it comes to dealing with cat hair and dog hair. It also includes a Pet Power Brush which has a suction driven brushroll. Like the vacuums above, the NV501 comes with a washable HEPA filter and Anti-Allergen Complete Seal technology. It also has LED headlights and, as the name suggests, the popular Lift Away feature which allows for portable cleaning. The NV501 carries a 5-year warranty. This isn’t really what we would call an upright. It is perhaps closer to a stick vacuum, but we still like the HV382’s performance on pet hair. It comes with the 2 brushrolls like the NV801 and is a corded machine (unlike many stick vacs today which run on rechargeable batteries). The “TruePet Mini Motorized Brush” is a hand tool with a motorized brushroll and, as the name suggests, is designed to pick up pet hair. This tool works well and is also small enough to get into nooks and crannies that the main cleaner head cannot. The HV382 can be used as both a stick vacuum and a handheld vacuum (see videos below). So the “TruePet Mini Motorized Brush” can be used on the end of the handheld vacuum or on the end of the wand which makes it quite versatile - it is great for upholstery and other above the floor cleaning. The unit is bagless and the filters are washable which keeps maintenance costs down. This vacuum has no HEPA filter or Anti-Allergen Complete Seal technology however. This is sometimes the case with a smaller vacuum. But it does come with a very respectable 5-year warranty. Euro-Pro Operating LLC recently merged their Shark (vacuums/steam-mops) and Ninja (small kitchen appliances) product lines to create SharkNinja. So you will now often see their vacuums and steam-mops under the name “SharkNinja” but it is the same group manufacturing these. The company has been growing rapidly and, according to Inc Magazine, it is now one of the top 5000 fastest growing companies in the USA. They also have offices in the UK, Canada and China. We've reviewed a host of the company's vacuum cleaners and their performance, innovative features and high consumer ratings often result in one or more of these machines making our best vacuum lists. This data would tend to indicate that the highest level of satisfaction for the least amount of money can be had with a Shark Vacuum. Now this isn’t exhaustively scientific but this is the data that we have been collecting over the past 10 years – you can draw your own conclusions. > What is the best Shark Vacuum for hardwood floors? I have been watching on your reviews. Thank you. They are great. I purchased the NV752 but found it much too heavy and hard on my wrist. I had to return it. I'm wondering if the NV800 is much lighter and easier to manouver? It looks smaller in your videos. I loved the features of the NV752, I just didn't like the size and weight. I have mostly laminate flooring, tile and low pile area rugs. Otherwise I was considering the Dyson dc37 canister. (much cheaper then the new big ball canister & I prefer it) Any suggestions? Awesome reviews. Thanks for the effort! 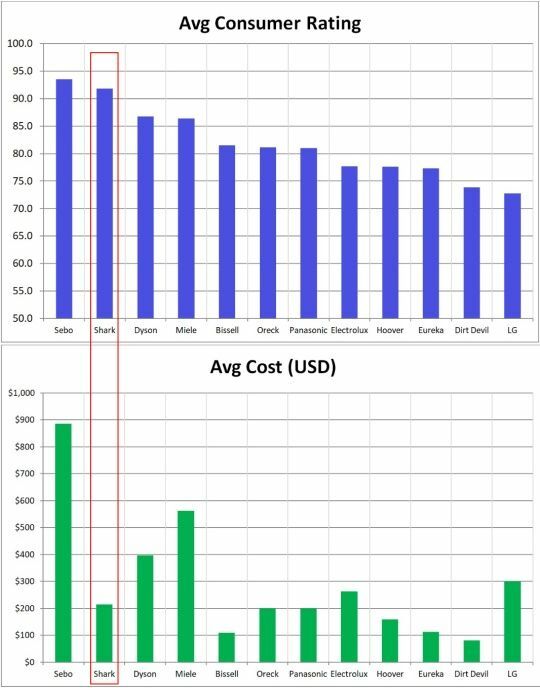 Nice overview of Shark vacuums. We have the NV752 but I am wondering if we should upgrade to a vacuum with the 2 brushrolls? They seem to work really well. Glad you liked our overview. While we like the vacuums with 2 brushrolls (DuoClean Technology) we also found that the NV752 performed very well on carpet, bare floors and even pet hair. In our opinion, if you have the NV752 you needn't rush out to get an upright with 2 brushrolls. Just what I was looking for. I knew I wanted a shark but I did not know which model would be the best one for my home and 2 cats. After reading this I feel pretty comfortable getting the Shark NV752 model. Thanks so much.